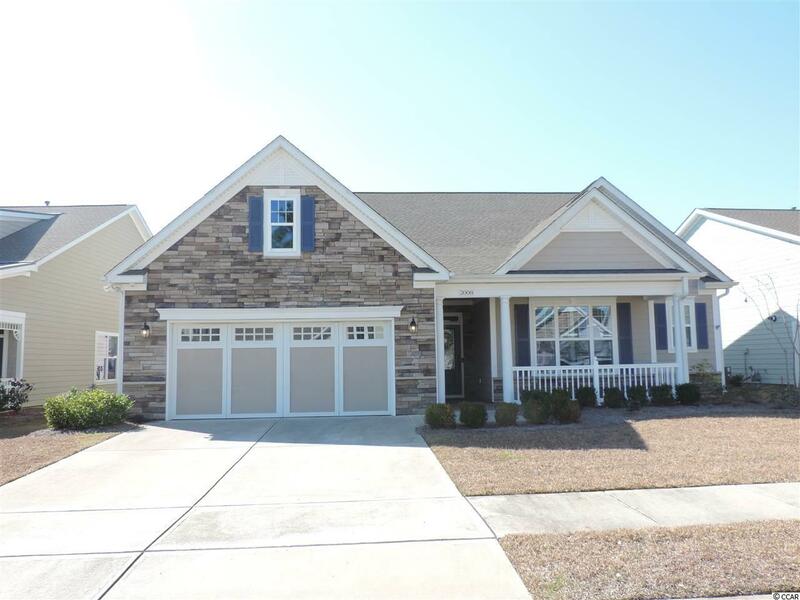 Don't miss your chance to live in one of Myrtle Beaches most prestigious communities down at Market Commons. This 4BR/3.5BA Hickory model sits on a premier lake front lot. The exterior of the home offers architectural details of stack stone and Hardie plank .Welcome your neighbors to stop on by and visit with you on your beautifully paved front porch. This professionally landscaped fenced back yard offers an extended paved back patio, with an added gas line so you can BBQ or enjoy an outdoor fire pit. While overlooking the large lake and fountain feel the calm ,relaxing feeling take over while kicking back and enjoying a magnificent sunsets. Now it's time to walk through the front door. Feel the warmth and inviting feel of this move - in ready home. The 11 ft ceilings throughout will give you this airy and open feel.The Great room, dinning room and master bedroom all offer beautiful wood flooring .Can you imagine yourself cozying up in front of a fire on a blustery winter day ? Love to cook and experiment with a new recipe ? This kitchen is a chefs delight.Nothing was spared ,42 in staggered cabinets, which are all soft closed, granite countertops, backsplash, double oven, upgraded gas range, along with dishwasher and microwave all stainless steel. Large eat in area with an oversized island makes this kitchen complete for entertaining. The dinning room has a full view of the lake along with a classic chandelier . After a full day of enjoying your coastal lifestyle enter your Master Suite. Enjoy your luxurious spa bathtub or fully tiled shower complete with custom glass doors The other two bedrooms on the first floor offers a Jack and Jill bath room complete with tiled tub / shower and custom glass doors.Upstairs has it own full bath and double closet which makes it the perfect space for your guest to stay. Throughout the house you will find custom plantation shutters, remote or dark out shades.Enjoy your tankless and energy efficient Rinnai water heater that will deliver your hot water when needed. Now let's get to the fun part . The amazing 12,000 sq ft RESORT AMENITIES CENTER. It features a large community pool , tennis courts, outside fireplace, and cabanas,.Worried about those rainy days and how you'll keep busy ? Worry no more. Inside offers a fully equipped fitness room, computer lab, pool tables and a great atmosphere for all those community socials and activities Wait I'm not done there are monthly activities that take place and all are welcomed and encouraged to join in. Remember your only minutes away from MB airport, shopping, dinning, movie theaters and MB State Park and famous Ocean Blvd. All of this can be a short golf cart ride away. Enjoy all the festivals and year round activities that take place right in the heart of Market Commons Cresswinds @ Market Commons is coastal living at it's BEST ! It is a LIFESTYLE THAT CANT BE BEAT! This property is on a Special Lender program. If the buyer chooses to use this Lender a portion of their closing costs will be paid by the Lender. Call Listing Agent for more information. Directions: Please Take Farrow Parkway To Main Entrance Of Cresswind . Make Your First Right Onto Suncrest . The Home Will Be On Your Left Hand Side .